The route to Westerham became the second of two branches to feed off the SER’s Tonbridge cut-off line, the latter of which fully opened to passenger traffic for the entirety of its length on 1st May 1868. It was preceded by the 1½-mile-long branch to Bromley (SER), which came into use on 1st January 1878 on a spur from Grove Park. The line’s beginnings date back to 22nd March 1876, when residents of Westerham submitted a Bill to Parliament for the construction of a through route between the SER's Tonbridge cut-off line at Dunton Green, and the LB&SCR's proposed Oxted route. The SER and LB&SCR were old enemies; indeed, until the completion of the diversionary route through Chislehurst and Orpington in 1868, there was prevalent animosity between the two over line usage between London Bridge and Redhill. Based on its experience, the SER wanted to avoid further contact with the LB&SCR, and refused to support the Dunton Green to Oxted proposals. Parliament agreed to approve the Bill, but only if the Westerham to Oxted section of the line was dropped from the scheme. Royal Assent for a 4¾-mile long branch between Dunton Green and Westerham was formally received on 24th July 1876. Promoted under the auspices of the ‘’Westerham Valley Company’’, the single-track branch came into use on 7th July 1881, being worked by the SER from the outset. Indeed, the company bought out the independent Westerham Valley Company in that August. 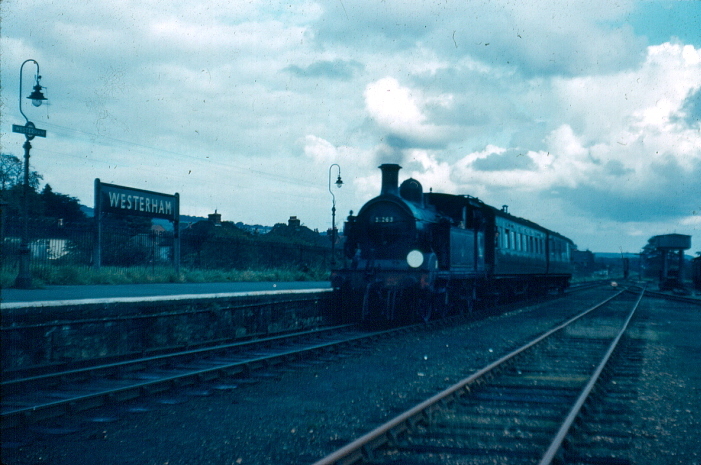 Westerham station was typically SER in character. The branch had been constructed during the thick of the company’s ‘’economical’’ era, which saw the provision of wooden buildings to keep costs and construction time to a minimum. The terminus arrangement here only ever included a single platform face from the outset, on the western side of the approaching line. It was host to a 70-foot long single-storey station building, constituted almost wholly of tongue-and-groove timber, set upon a low brick base (a slightly smaller variant of this same design also came into use at the intermediate site at Brasted). This featured a pyramid-shaped slated roof, from which emerged a pair of brick-built chimneystacks. The building was equipped with a very slightly upward-sloping platform canopy, which ran the full 70-foot of the main structure, this being supported by seven stanchions and coming complete with a simple, but attractive, spiked valance. A small wooden appendix existed alongside the main building’s southern elevation, solely for the storage of bicycles. The platform was brick-built (the terminus at Hawkhurst was notable for having a platform constituted of wooden railway sleepers), and was lit by diamond-shaped wrought-iron gas lamps. The layout encompassed features synonymous with rural branch line termini. Essentially, goods facilities comprised two lengthy sidings: the first of these extended for 285 yards – more or less the entire length of the station layout – and terminated end-on to a dock platform. This line also passed through a 30-foot long single-track goods shed. Like the main building, this was fabricated from timber, set upon a shallow brick base. It comprised double wooden doors on both sides, a small porch canopy on its eastern elevation, and its entrance was protected by a loading gauge. The latter was also in the company of a five-ton lifting crane. The second siding, running along the eastern perimeter of the site, was a shorter affair, being 185 yards in length and serving a 95-foot-long row of coal staithes. Being situated at the end of the line, a 50-foot-long engine shed was provided at Westerham, this being situated 320-feet beyond the platform, at the Dunton Green end of the layout. This was a through affair, again fabricated from the familiar timber set upon a brick base, and was used to stable terminating locomotives overnight. Unusually, however, no turntable was ever installed, perhaps because initially, only tank engines (which could operate effectively backwards or forwards) were envisaged to operate the bulk of the services. An iron water tank was, however, in evidence, this being suspended upon stilts alongside the shed road. The entire branch, inclusive of Dunton Green station, had been signalled by contractors Stevens & Sons, and a signal box of this company’s design appeared 20-feet beyond the northern end of Westerham’s platform. This was a two-storey affair, comprising thirteen levers, and in keeping with the layout, was constituted wholly of timber, the base included. The cabin here controlled three signal posts: two ‘’home’’ posts and a single ‘’shunt’’ signal for access to the goods yard. Stevens & Sons carried out further signalling work for the SER in the following year, 1882, along the branch from Hoo Junction to Port Victoria. Under the SE&CR, notable changes were made to the services. The company had entered a period that favoured the humble railmotor, this of which was essentially a small locomotive and carriage built on a common chassis. The turn of the 20th Century saw railway companies – not just the SE&CR – experience increasing competition from trams and buses for local traffic. Consequently, numerous wooden-fabricated halt platforms were established, to provide an improved local service to sparsely populated areas. A steam railmotor operation commenced along the Westerham branch on 16th April 1906, and a single wooden platform came into use in-between Dunton Green and Brasted, named ‘’Chevening Halt’’. Consequently, the engine shed at Westerham became redundant, but nevertheless remained standing. The railmotors were Bricklayers Arms-based, and fifty-six hard wooden seats provided an uncomfortable ride. Underpowered for the diagrams employed on, their existence was not helped by the fact that passengers sitting in the carriage compartment nearest the locomotive had to suffer significant heat generated by the firebox! By 1909, the SE&CR had seen the error of its ways and at Ashford Works in February of that year, the company began the construction of what would become a batch of eight 0-6-0 ‘’P’’ Class locomotives, to take over the railmotors’ duties. The latter were recycled into locomotive-hauled carriage stock. On the advent of the Southern Railway, electrification of ex-SE&CR suburban lines was swift, and by July 1925 Orpington already had its first electric service. Ten years later, the SR completed the extension of third rail to Sevenoaks, but unlike the Bromley North branch, the line to Westerham was never electrified during the works, no doubt due to its location outside of the main suburban operation, combined with its light traffic. 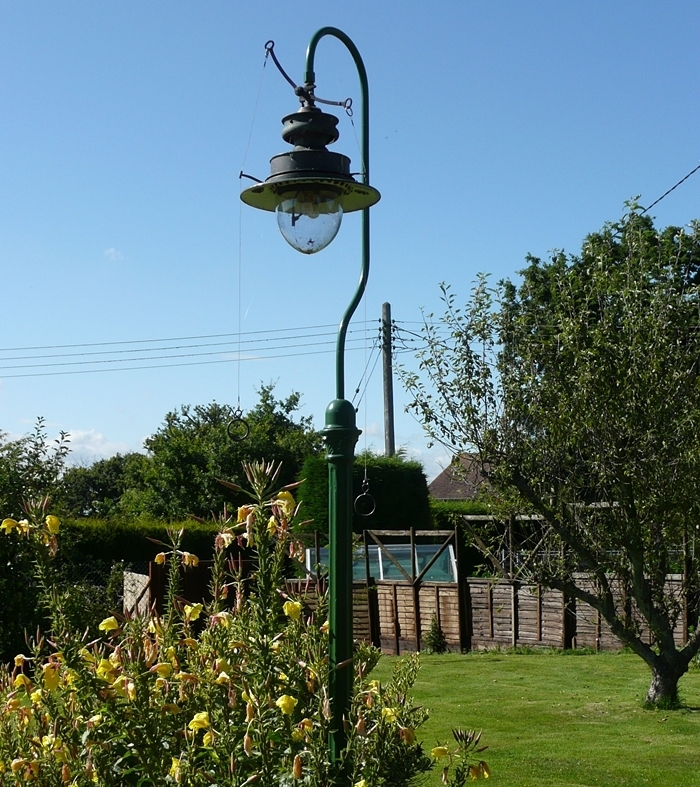 Nevertheless, this did not prevent some form of modernisation at the site, and during the 1935 scheme, the SR replaced the diamond-shaped gas lamps with its distinctive swan-neck variant. These came complete with affixed ‘’Target’’ name signs. Exmouth Junction prefabricated concrete fencing also appeared to the immediate south of the station building at this time, running along the remains of the perimeter and terminating in line with the buffer stops. A decade earlier, the redundant timber engine shed was razed to the ground, but the brick foundations remained in evidence until the end of the route’s existence. Although the SR excluded the branch from the 1935 electrification scheme, avoiding infrastructure costs, the company still sought to modernise the traction on the line. In 1936, a 44-seat capacity steam rail bus, built by Sentinel-Cammell, was deployed on the branch. This had been drafted in from the single-track Hove to Devil's Dyke branch in Sussex, a line of steep gradients which had originally opened on 1st September 1887. Here, it was discovered that the rail bus neither had adequate power to ascend the gradients, nor enough braking force whilst descending, but its high gearing ratio had the potential to speed up times on the short Westerham branch. It soon transpired to be even more unsuccessful than the railmotors of the SE&CR, and a series of failures saw that it remained in service for just a matter of months. The rail buses had a particular disadvantage when maintenance was required: taking the traction out of service for repair also meant withdrawing the passenger accommodation, the two naturally being one of the same thing. Throughout its entire existence, this tranquil station changed little, apart for some minor modifications to the track layout. During the latter Southern Railway era and early British Railways days, the branch was worked by ex-LC&DR ‘’R’’ Class 0-4-4 locomotives. These engines operated in push-pull mode with carriage stock that had been converted from the doomed SE&CR railmotor sets. In 1952, a general stock replacement scheme on the branch began, which included drafting in ex-SE&CR ‘’H’’ Class 0-4-4 tank engines to replace the elderly locomotives of LC&DR origin. In addition, the converted railmotor sets were replaced with Maunsell-designed carriages which had been cascaded down from main line use, and these in turn were modified for push-pull operation. The February 1956-approved £45,000,000 Kent Coast Electrification (£777,000,000 at today’s prices) would result in the branch becoming an isolated steam-operated appendix of a modernised main line. On 12th June 1961, scheduled electric services commenced via the ex-SER route to Dover (although the full electric timetable did not commence until the 18th of the following year), and the closure of the Paddock Wood to Hawkhurst branch coincided with this. Despite this, the Westerham line continued to operate, but the end was nigh. Reportedly, the branch was creating a total loss of £26,000 (approximately £430,232 at 2007 prices) per year for British Rail, and with hints of a new London Orbital motorway requiring much of the track bed site, the line was doomed. 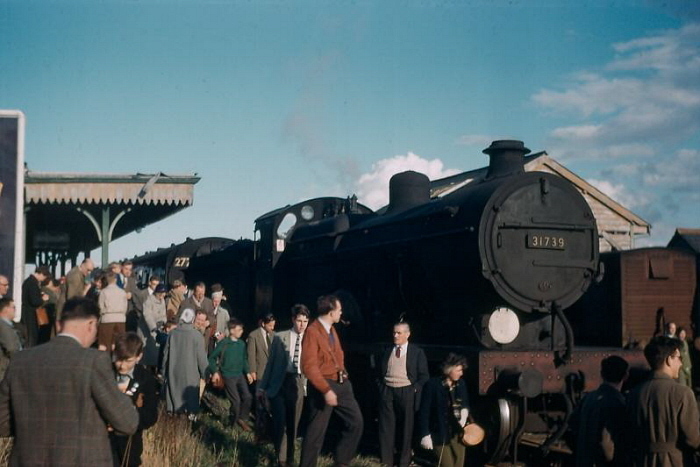 The final day of passenger operation was on 28th October 1961, and was probably the line's busiest since the original opening eighty years previously. During the last day, ''H'' Class No. 31518 operated the morning push-pull services along the line, whilst tender engines in the form of ex-SE&CR D1 Class No. 31739, and ex-SR Q1 Class No. 33029, appeared in the afternoon hauling ''main line'' stock. Local opposition to the branch's closure had been strong, and although a sizeable petition and a Parliamentary debate had failed to prevent the cessation of services, all was not yet lost. In March 1962, the ''Westerham Valley Railway Association'' (WVRA) was formed, which aimed to purchase the line and its infrastructure, and run its own private services. In July of that year, the organisation took out a lease on the main timber-fabricated station building at Westerham, which provided office accommodation, and subsequently, the tired-looking structure was cosmetically restored. A lease on the building at Brasted station soon followed, although the headquarters of the group remained at Westerham. Negotiations with British Railways had revealed an asking price of £30,000 (about £481,062 at 2007 prices) for the entire branch, but as part of this agreement, the nationalised organisation required the WVRA to operate a commuter service. This condition was another cost-cutting measure to work in BR's favour: to compensate the local community for the withdrawal of rail services from Westerham, BR was compelled to contribute £8,700 (about £130,000 at 2007 prices) towards the running of a bus service to and from Dunton Green. The WVRA commenced its search for suitable rolling stock, and with the prospect of acquiring a trio of ex-GWR diesel railcars, the running of a railway service looked likely. Ex-SE&CR 0-4-4 ''H'' Class No. 31263 was purchased from BR and arrived at the site from Three Bridges, and a motley collection of former Metropolitan and SE&CR passenger rolling stock was acquired. Plans were thwarted, however, as Kent County Council intervened on the grounds that much of the track bed was required for a proposed London Orbital motorway (later to become the M25). Unless the WVRA was able to find over £26,000 (about £380,000 at 2007 prices) to compensate the council for the installation of a bridge over the line, then a compulsory purchase of the route would be undertaken, followed shortly by the infilling of much of the track bed. The organisation was unable to meet such a high financial obligation, and consequently, the entire railway scheme fell on stony ground. The main station building at Westerham was flattened during 1966, but that at Brasted survived in a derelict state until 1978. Construction of the Westerham to Godstone and Sundridge Road to Westerham sections of the London Orbital commenced in the July and December of 1976 respectively.